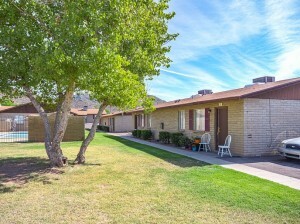 Phoenix, AZ – May 25, 2017 – ABI Multifamily, the Western US's leading multifamily brokerage and advisory services firm, is pleased to announce the $2,450,000 / $55,682 Per Unit sale of the Garden Cove Apartments located in Phoenix, Arizona. Garden Cove is a one story, garden-style apartment community which rests on approximately 2.28 acres. The property was built of block construction with pitched roofs and individually metered for electricity. The property is comprised of 44 - 2 bedroom units with a weighted average size of 833 square feet. "The Northwest Phoenix submarket is one of the most under-rated in the Phoenix MSA," states Nathan Bruer, Vice President, who along with Rue Bax, Senior Managing Partner, were the lead brokers for this transaction. "The east side of the I-17 Corridor from Thunderbird to just north of the 101 has witnessed some 1,500+ new job announcements within the last 18 months alone, second only to North Tempe over the same time period. The Buyer, already familiar with the area and submarket trends was seeking another property in this solid performing submarket where average rents are approximately $200 below that of the Metro and with occupancy at, or near, historic highs." "This is a prime example of the profits that can be made by market timing," states Rue Bax. "First, the Seller purchased the property near the bottom of the market in 2012 and did what they do best, renovate and reposition. Northwest Phoenix was, for many years, a submarket in transition due its close proximity to the more central submarkets of the I-17 Corridor where more workforce housing reigns supreme. As the multifamily market heated up, jobs, then investors, began pushing further and further north from Peoria to the I-17/101 interchange and beyond. The Seller anticipated this movement and was able to reap an amazing profit." The Buyer is an experienced private investor based in California with other multifamily property holdings in the Phoenix MSA. The multifamily brokerage team of Nathan Bruer, Rue Bax, Patrick Burch, John Klocek, Ryan Smith and Royce Munroe represented both the Buyer and Seller in this transation.